Considered by many cocktail lovers to be the Scottish version of the popular Manhattan, the Rob Roy differs from its predecessor by using Scotch in the recipe instead of rye or bourbon. Try a classic Rob Roy, and then compare it to the dry and perfect versions to decide which one is your favorite. While the basic ingredients in a classic Rob Roy are always the same, the exact measurements used may vary slightly from one bartender to the next. Generally speaking, most recipes call for a roughly 2:1 ratio of Scotch to vermouth. The following recipe calls for just a touch more Scotch, but feel free to adjust the measurements to your own taste once you give it a try. Add some cracked ice to a shaker. Pour in the Scotch, vermouth, and bitters. Shake briefly, and strain the contents into a cocktail glass. Garnish the drink with the Maraschino cherry. As an alternative, you can simply pour the ingredients into a cocktail glass and stir them together if you don't need your cocktail to be ice cold. The flavor of this drink won't suffer for lack of ice. Try the drink both ways and decide if you have a preference one way or the other. 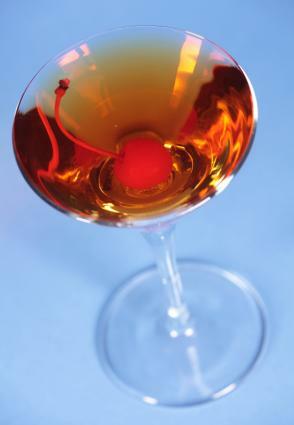 The classic Rob Roy is considered the "sweet" version of the drink because it uses sweet vermouth. However, there are other versions that offer a slightly different taste. Each one has its merits, and a lot depends on whether you prefer your cocktail on the sweet side, the dry side, or somewhere in between. To make a dry version of this cocktail, simply substitute 1 ounce of dry vermouth for the 1 ounce of sweet vermouth. In keeping with this less sweet version, garnish the cocktail with a lemon twist instead of a Maraschino cherry. The perfect version of the Rob Roy strikes a balance between sweet and dry by using 1/2 ounce each of dry and sweet vermouth for the total volume of vermouth. This version also calls for a lemon twist as garnish, but feel free to use a Maraschino cherry, a lemon twist, or both if you like. Rob Roy himself is considered a national hero in Scotland and is generally portrayed as a highland version of Robin Hood. There's much more to the story than that, but the fact is the cocktail isn't named for him exactly. According to Prime Magazine, the drink was created at the Waldorf Hotel sometime in the 1890s when blended Scotch became available in the U.S., and it was actually named after a Broadway play about Rob Roy. Add that little gem of cocktail trivia to your conversation the next time you enjoy this classic drink with friends.